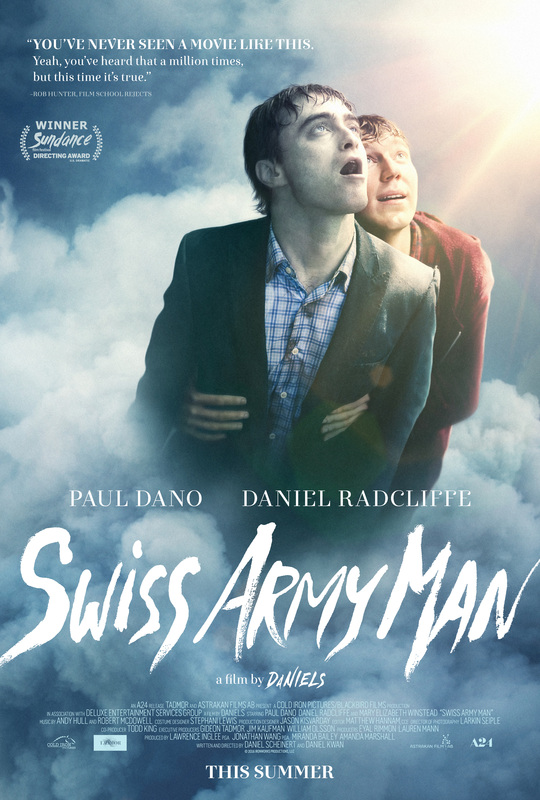 The directors of SWISS ARMY MAN say the movie is about farting. I’d go them one better. It’s about farting and mental illness. This is one batshit weird movie that is absolutely great. Paul Dano is stranded on an island and about to hang himself when he notices the body of Daniel Radcliffe wash up on shore. He runs to him hoping he’s alive. Is he alive? Well, after a while Dano really believes Radcliffe is alive. And that is when the real fun, weirdness begins. Dano uses Radcliffe like a multi-tool all to get back to civilization. His farts power him like a motorboat. He stores and regurgitates water. He can launch projectiles over great distances like an air rifle. His male parts act like a homing device, pointing the way home. And he talks. So he’s not dead, because he talks. But maybe he is dead and it is all in Dano’s head. As Dano traverses a forest with Radcliffe in tow, he keeps checking his phone for a signal. His battery is seriously low. So he tries to keep it off as much as possible. But Radcliffe gets a glimpse of the beautiful woman on the lock screen and makes up a whole life story about her that he has to return to. But is it his story, or Dano’s. I’m trying to decide how much to reveal here about where the story goes, but suffice it to say I have only scratched the surface. The film seems to be about one thing, namely a man’s struggle for survival. But it may really be about mental illness and depression and how we deal with a disappointing life. Or maybe both are the same thing? It is an interesting question that the filmmakers only partially answer and leave it to the audience to decide. Dan Kwan and Daniel Scheinert are “Daniels”, the directors and screenwriters. They have crafted a funny and touching story that will leave you thinking and scratching your head with wonder. It will also have you laughing out loud for much of its 95 minutes. Dano and Radcliffe are outstanding actors and have instant chemistry. That really helps ground this weird premise and difficult story. Any film that makes me think, that makes me question my life and my choices is one to put on the top of the year’s best. SWISS ARMY MAN is one of those films. Pixar has established itself as the go to studio for comedies with a lot of heart. Movies like WALL-E, UP, INSIDE OUT, and the three TOY STORY films are funny and touching without being sentimental. They also deliver a message without bludgeoning the audience over the head. FINDING DORY is a very good. The way overdue sequel to FINDING NEMO brings back Nemo, Marlin and of course Dory. It also adds some great new characters the best of which is Hank the Septopus (he lost a tentacle in an accident), voiced by Ed O’Neill. 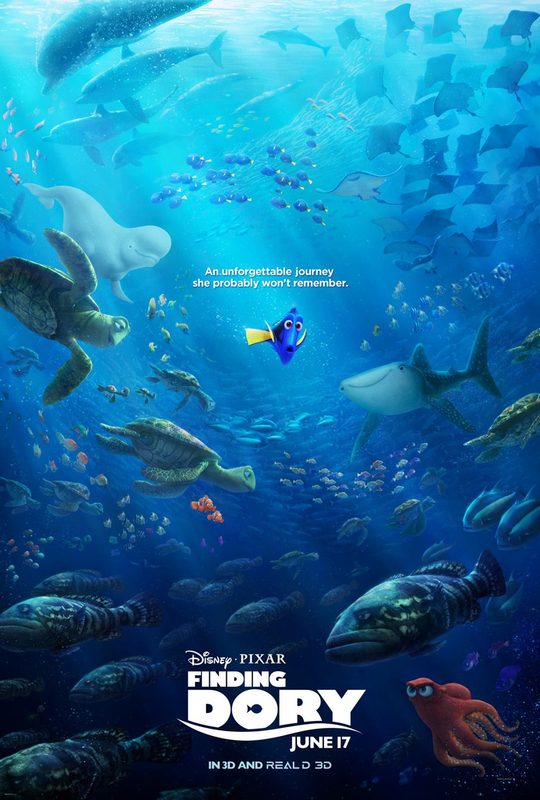 DORY features the Blue Tang voiced by Ellen Degeneres in her search for her family. She’s finding them, while Nemo and Marlin are trying to find her. That takes Dory from her home to Morro Bay in search of her parents. Other than overcoming the obstacles and challenges you expect, Dory must overcome her disability. As she tells everyone she encounters, she has short term memory problems. That means she forgets directions and clues to her parents whereabouts almost as soon as she learns about them. The message is clear: just because you aren’t like other fish (kids) that doesn’t mean you can’t find happiness and achieve great things. Ok, we got it. Message sent and received. Over and over again. Enough already, I got it! The movie is funny, has tons of heart and really outstanding animation and voice work by a great cast. Hey, it’s a Pixar movie, what else did you expect. The kids will love it. There is nothing too scary or shocking. But it lacks the craft of those films I mentioned earlier so even a very good Pixar movie can be a disappointment. I also want to mention the short, PIPER. It is adorable with simply amazing animation. The water and surf and detail in the birds feathers is a real achievement. Apparently those are extremely difficult to bring to life. Well, Pixar has done it. Can’t wait to see how they use that technology in future movies. By Stormy Curry. How many times has Hollywood tried to do a sequel too many years after the original and failed miserably? I expected Dory to be an okay matinee with the kids…but what I found was something much more. This movie was, dare I say, as good as the first. Disney understands that to sell merchandise the product has to be great (Marvel movies, Star Wars, and Pixar) and this one is great. A new story with old and new characters, it’s funny and filled with heart…and also goes places you would not expect a kids movie to go. Another classic from a studio that’s on a roll…this one’s for kids and adults alike. For a project with Eli Roth’s name attached (as producer), this is surprisingly restrained, a little over-serious and low on gore and scares. But there is a line that gets stepped over, and it’s the fact that the victims are kids. Little kids. Who die unspeakably maimed and eaten, with what’s left of their little corpses just a bone here, a squish of red pulp there. And the victims are extra adorable, making their slaughter and defilement extra uncomfortable . The story of a father who puts on a clown suit for his kid’s birthday party and then can’t get it off, with demon-inhabiting results, is steadily developed without cheap tricks. But it really could have used more juice. Peter Stormare has the Donald Pleasance role as the demon’s scourge, the others are unmemorable, as is the movie. Forget about the plot; it’s irrelevant, and besides, you’ve seen it a thousand times: the CIA agent on the run, the miniaturized device that everyone’s trying to get hold of, the puzzle as to who’s the good guy, who’s the bad. 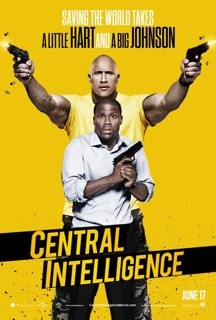 What you’ll go to see this for is the riffing that ricochets between Kevin Hart and Dwayne Johnson as the former gets sucked unwillingly into the latter’s do-or-die adventure. Hart, of course, is a proven laugh-getter, and watching his inner hero gradually overcome his outer wimp is a treat. The bigger surprise, perhaps, is Johnson, whose goofy earnestness muscles in on his, well, muscles, making him an effective foil. The story is slapdash, characters are introduced and misused or throw away — Amy Ryan’s role is especially nonsensical — but all credit to Jason Bateman for turning up briefly and walking away with his scene (although the vengeance wreaked on him at the end is sloppy and unsatisfying). And there are decent cameos from Aaron Paul and a superstar comic actress (I won’t spoil it). In a week when I need a laugh, CENTRAL INTELLIGENCE provided just what I needed. The Kevin Hart-Dwayne Johnson vehicle is light on plot, but long on chuckles. What there is of a plot goes like this. Hart and Johnson went to the same high school. Hart was the most popular kid in school. Johnson was the weird fat kid. Fast forward 20 years and Hart is disappointed in his lot in life. He’s middle management, an accountant. The 20 year reunion is coming up and he gets a weird friend request on Facebook. It turns out to be Johnson, who is no longer fat, he’s well, The Rock. Johnson is a CIA agent on the run. His bosses think he’s selling satellite codes to America’s enemies. But Johnson is really trying to ferret out the spy and he hooks up with Hart because of his “mad accounting skills”. There’s a lot of fish out of water comedy here as Hart tries to get around the world of spying, including gunfights and beat downs. Johnson is also something of a fish out of water. He is still the insecure fat kid who got picked on in high school. He constantly seeks Hart’s approval and friendship. That is the tougher role to play here. Hart is basically playing himself, or a version of himself. Johnson is playing tough, but just “playing”. Or is he? Aaron Paul and Amy Ryan have small roles as CIA operatives. Paul is Johnson’s dead partner. Ryan is the agent tasked with bringing Johnson in. The story barely hangs together. But Hart and Johnson have some real chemistry. There are a lot of funny bits laced throughout and there are a bunch of decent action set pieces. This isn’t brainy comedy. But it was kinda fun and probably worth watching again when it hits cable. Funny, raucous, sweet and touching at the same time. Keeps going to the very end, and may actually get even better as it goes along. Andy Samberg has come a long way from sketch comedy. Hilariously stupid as the jokes are (and that’s a compliment), Samberg’s Conner is a fleshed-out human being, with subtle comic and dramatic “takes”— watch him read his first bad reviews — that animate his dorky handsome face and hint at a wider career ahead. Maybe even like Sean Penn after FAST TIMES. The performance is complimented beautifully by Andy’s fellow Lonely Island partner, Jorma Taccone, as the best friend Conner mistreats. (Think Bojack Horseman and Todd.) Speaking of Bojack, Will Arnett kills as Harvey Levin (officially “Main CMZ Reporter”) — leaning over a cubicle and lording it over his sycophantic staff (including a dreadlocked guy clearly meant to be Charles Latibeaudiere). There’s a timely jab at the Internet of Things with a gag about Conner’s music being installed in home appliances. Plus, an award show roster of powerhouse music producers and performers (from Nas to DJ Khaled, Mariah Carey to Michael Bolton) that gives the mock-doc heft — in a brainless and low and welcome way. Serious, steady and slow, don’t go in expecting the nasty-violent James Wan of SAW, which may be why mainstream critics are going for it (74% vs SAW’s 48%). At almost two-and-a-quarter hours, it seems stretched and at times inert — with lots of stuff you’ve seen before: the slow step-ups to doors that open revealing no one there; the shadows at the end of hallways; the toy that suddenly starts operating on its own; the kid on the ceiling. On the plus side, there’s something fascinating about Vera Farmiga’s Lorraine, partly because of her deadpan demeanor, which borders on the comic. (Carol Burnett could have lampooned her perfectly.) At times, Farmiga’s stricken, so-so-serious act bumps up against the essential ridiculousness of the plot. But she also creates most of what little atmospheric dread the movie has. And atmosphere is pretty much it. The monster looks like Gene Simmons after entering a convent, and while its morphing mouth is a bloody kick, I’m having trouble remembering any other solid effects. Maybe the thing with the dog, but… meh.